The rich music of composer Richard Wagner was the topic of choice for the Ring lecture on Wednesday night in the Campus Center Ballroom A. Professor of Music Kathleen Lamkin gave the lecture titled “Drama in Wagner’s ‘Ring:’ Music Propels the Action,” the last of the series, for 30 students and faculty members. The lecture focused on Richard Wagner’s four operas “Der Ring des Nibelungen,” also known as the “Ring Cycle,” and his adventurous life as a composer. “After Wagner, music would never be the same,” Lamkin said. The LA Opera is staging “Der Ring des Nibelungen” from now until June 30. 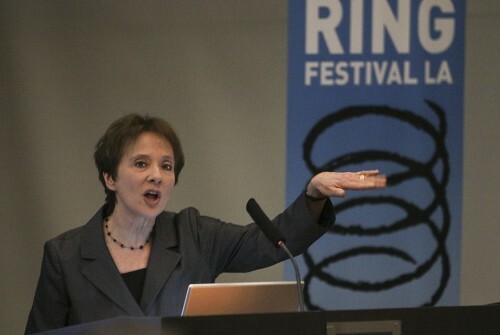 Lamkin repeatedly referred to the Ring Festival L.A. because she wanted everyone to experience the operas that could potentially enrich one’s life. Lamkin showed a slide show during her lecture and talked about Wagner’s life and every opera in the “Ring Cycle.” Students and faculty were captivated by the unbelievable work Wagner accomplished and the impact it still has today. Wagner’s early years foreshadowed his future work as a composer. Wagner, born in Germany, showed interest in music at an early age and was self-taught. The lecture highlighted his life as a young man but also as a composer, writer, conductor, theater director and designer. “I’m a huge history buff and learning about Wagner and his thought process is great,” junior music major Nicee Gonzalez said. Wagner is considered by many to be a man before his time always looking for the innovation. The “Ring Cycle,” which he is most famous for, took him 30 years to compose and perfect. The debut of the completed cycle was in Bayreuth, Germany at the Festival Playhouse. Lamkin reminisced about when she went with her husband to the playhouse and they did not sit next to each other but the seats they managed to purchase were wonderful. The first opera “Das Rheingold,” is about the dwarf Alberich who renounces love and steals Rhine gold and creates a ring before a curse is set upon it. This opera has four dramatic scenes. The second opera, “Die Walkure (The Valkyrie)” is about two characters, Siegmund and Sieglinde, who fall in love despite the fact that Sieglinde is married. Lamkin played a piece from the opera, “Ride of the Valkyries,” which is a familiar song to many, though few know the actual name. The third opera, “Siegfried,” was a personal opera to Wagner because he named it after his son. The final opera is “Gotterdammerung (Twilight of the Gods),” with the underlying message that love redeems all and nothing is more powerful. Lamkin said she wanted students and faculty to be enriched by the music.